“There’s more than sufficient evidence for this case to go to the jury on all counts,” the judge said of the indictment against the former elected officials. 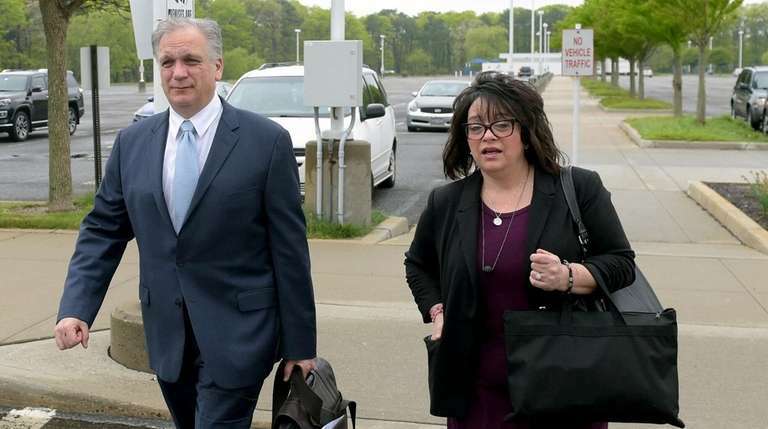 The judge overseeing the 10-week-old federal corruption trial of former Nassau County Executive Edward Mangano, his wife, Linda, and former Oyster Bay Town Supervisor John Venditto on Monday rejected their efforts to have their charges dismissed. Closing arguments are expected to begin Tuesday morning. Jurors have heard nine weeks of testimony put forth by prosecutors in efforts to buttress their case that Edward Mangano and Venditto took bribes from restaurateur Harendra Singh. The elected officials, in exchange, helped Singh to secure two lucrative county contracts and more than $20 million in town-guaranteed loans, prosecutors say. The charges against Mangano, 56, of Bethpage, and Venditto, 68, of North Massapequa, include conspiracy to commit federal program bribery and honest-services wire fraud, extortion for Mangano and securities fraud for Venditto. The charges against Linda Mangano, 54, of Bethpage, are charges of conspiracy to obstruct justice, obstruction of justice and making false statements to the FBI. 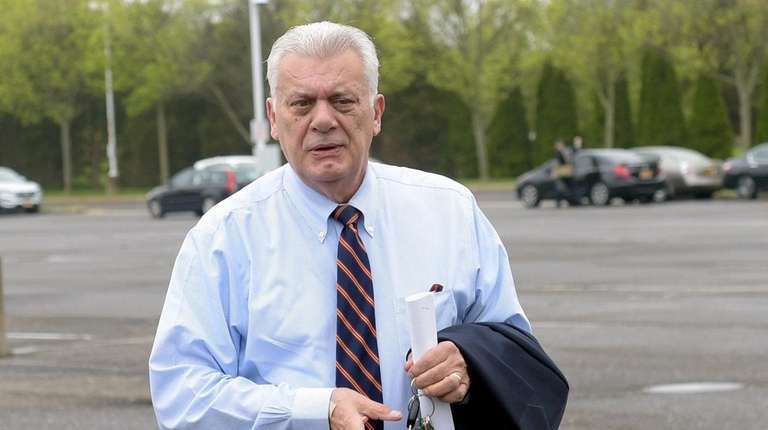 On Monday afternoon, Azrack also denied a request by Venditto’s defense team that she give jurors “advice-of-counsel instruction.” Venditto’s attorneys had sought to make the case that he was acting on the guidance of his lawyers during his time as town supervisor. Earlier Monday after the jurors had been dismissed for the day, defense attorneys argued that the testimony and evidence introduced was not sufficient enough to go to the jury — a routine legal motion in criminal trials. Kevin Keating of Garden City, who represents Edward Mangano, focused first on the honest-services fraud and bribery counts against his client. A bribery conviction requires that a public official perform an official act in return for a thing of value, Keating noted. Keating said that what prosecutors say Mangano did — gathering with officials, setting up meetings, giving advice — were not official Nassau County acts. And the former county executive cannot be held responsible for what the Town of Oyster Bay did, he said. Keating cited the pivotal April 28, 2010, meeting of county and town officials and attorneys at Venditto’s campaign headquarters in North Massapequa. Singh went on to secure a $1.5 million line of credit using Oyster Bay’s creditworthiness soon afterward — his first of a series of town-guaranteed loans. There was no evidence of a crime and several witnesses said Mangano remained silent at that meeting, Keating said. Jonathan Sinnreich, outside counsel to Oyster Bay, had testified, however, that he recalled Mangano speaking and advocating for Singh. Keating said Mangano’s role in the loan guarantees ended with that meeting and never involved Nassau County. Assistant U.S. Attorney Catherine Mirabile said Sinnreich and then-Deputy Town Supervisor Leonard Genova had halted Singh’s pursuit of town-guaranteed loans until Mangano got involved at Singh’s request. Even if jurors accept that Mangano remained silent at the April 28, 2010, meeting, his presence said plenty, she said. It said: “Make this work for Harendra Singh,” Mirabile said. Also Monday, Linda Mangano’s attorney, Carman, conceded that his client had a “low-show job,” but not that she lied to federal agents as charged. She was never informed of what her supposed lies were, he said. “Linda’s actual statements are unknown,” he said. The attendees at the April 28, 2010, meeting had included Sinnreich, who had testified that he vehemently opposed the town backing loans for Singh — and Venditto had him speak first, Agnifilo noted. “A bad-faith meeting would not include Sinnreich,” he said. Azrack noted that Mangano was there, too. “Is John Venditto supposed to lock the door and tell the county executive he can’t come in?” Agnifilo responded. Azrack asked about Singh testifying that he bribed Venditto. Assistant U.S. Attorney Lara Treinis Gatz said the evidence of a crime is that so many town officials went to such lengths to get Singh his financing. All these town officials acted at Venditto’s direction, and he acted because Mangano leaned on him, she argued.